Recently I went to see this year’s New York City Opera Renaissance production of Puccini’s Tosca, which originally premiered in Rome in 1900. The action is set in the year 1800, also in Rome, and the story provides quite a few points of reflection from a Stoic perspective. Briefly (you can read a more in-depth summary here) the three main characters are the painter Mario Cavaradossi, his lover, the singer Floria Tosca, and the brutal chief of the Roman police, Baron Scarpia. The plot revolves around Cavaradossi giving refuge to Cesare Angelotti, a political prisoner who has just escaped from prison. Scarpia is after Angelotti, and imprisons and tortures Cavaradossi. He offers a devil’s bargain to Tosca: if she gives herself to him, Cavaradossi will be subjected to a mock execution and the two will be able to leave Rome. Tosca secures a written safe-conduct, then stabs Scarpia to death. But Scarpia has the last laugh: the execution of Cavaradossi is real, not staged. 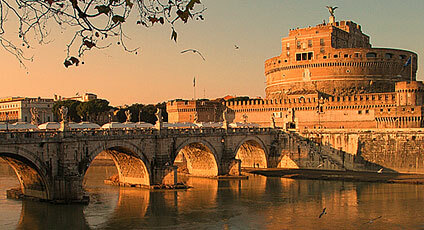 When Tosca realizes what has happened she leaps to her death from the Castel Sant’Angelo (see photo). Let’s start with the easy characters: Scarpia and Angelotti. The first one is obviously, irredeemably, bad. There is nothing virtuous in his support of a corrupt political system, in the obvious delight he takes in ordering the torture of Cavaradossi, in the obscene proposal he makes to Tosca, and finally in his betrayal of his word which results in Cavaradossi’s execution. From a Stoic perspective, he is a classic example of a person affected by profound amathia. Although a minor character, Scarpia’s specular image is the fugitive Angelotti. He is fighting for his ideals, which in this case will turn out to be misguided, as Napoleon was no friend of liberty, but still. When he is discovered, he takes “the open door,” as Epictetus would put it, in order not to give the satisfaction to his enemies of holding him and killing him on their own terms. And we finally arrive at Tosca herself. She begins pretty badly. During the first act she comes across as affected by petty (and unjustified) jealousy toward her lover, a sentiment that Scarpia exploits in the second act for his own nefarious purposes. Moreover, when she hears Cavaradossi being tortured in the room next to Scarpia’s office she pleads with the Baron and betrays Angelotti, who as a result loses his life. Questo e` il bacio di Tosca! Guardami, son Tosca, o Scarpia! Roughly: “this is Tosca’s kiss! Look at me, Scarpia, I am Tosca! Die, you damned! Not bad for someone who until a few minutes earlier was a stereotypically superficial and frightened woman. And of course, after she realizes that Scarpia had no intention to save her lover, she takes the only possible course of action at the end of the opera, jumping off the Castello to her death below. It’s a beautiful opera, but also — like all great art — a study in human character, one that both Stoics and non can certainly appreciate and learn from. Now, one could reasonably ask: why see an opera, or a movie, or any other piece of art, from a particular philosophical perspective? The answer is that we all do, and that indeed it is impossible to appreciate art if one doesn’t do so from within one’s philosophical (or religious) framework. It’s just that most people don’t reflect on this and are therefore not aware of it. This entry was posted in Stoicism & pop culture on February 4, 2016 by Massimo. I just love this Massimo! I’ve found that seeing art, films, operas, etc. through philosophical views can actually enhance the experience and my appreciation of the work. Fantastic, article. Please keep them coming.